My last post asked people to look upwards; in particular, to cast eyes at the night sky and “wonder”. Not foolish enough to think my cosmic ponderings could ignite embers in those not inclined – I did vow to try “baby steps” – patient little steps intended to draw attention away from planet earth. Beginning with a video of lightning and auroras as seen from the space station, and linked below – next stop is Mars. On April 8 of this year, Earth will pass between the Sun and Mars. This happens every few years, making 2014 a “good” year for Mars viewing. The months leading up to and following this date are perfect for Mars watching. Rising in the east, by April it will be visible from dusk until dawn. 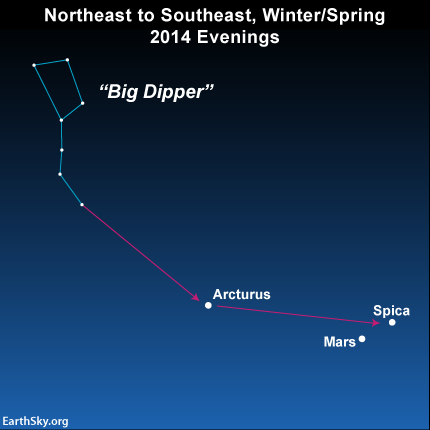 Here’s one way to find Mars, and the star Spica nearby, if you’re in the Northern Hemisphere. 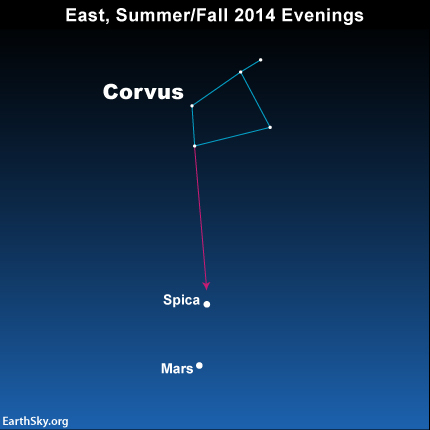 Here’s a way to find Mars, and the star Spica, if you’re in the Southern Hemisphere. I can’t ask anyone to find wonder, all I can do is offer tools and hope for the best. I will promise one thing – once you get some sky basics under your belt, you’ll be hungry for more. I’ll conclude with a few Mars facts – due to elliptical orbits, the distance from Earth to Mars swings wildly. The closest distance being 56 million Km., and greatest 401 million Km. Mars is the fourth planet from the Sun, the first “visit” was by Mariner 4 in 1965. Olympus Mons is the tallest mountain, with a base of 500 Km, it rises 24 Km above its surroundings and has a cliff on one side measuring 6 Km. Scientists believe surface water was present millions of years ago – a conclusion drawn from extensive images of erosion. In 1996, meteorite ALH84001 – believed to be of Mars origin – was reported to contain fossilized micro-organisms; still debated by scientific communities, yet something to ponder.